Forgot the hydraulic press. Peanut butter, avocado, algae just bulging with oil. Various comparisons, walnuts per mile, roasted or not. Is this the same 'Scout' in your July 26 post? If so, please dear god, don't tell me you put gas in it because you couldn't find biodiesel. Does the engine still run? Diesel engines need the lubrication provided by diesel fuel and gas has absolutely no lubrication value. I am 100% astonished that the entire engine didn't self detonate on gas. I wouldn't push you luck any more. Well it's great that your making this trip...but it seems like you should of done a little more in preparation...and why did you pick a 30 yr old vehicle that will more than likely break down on the trip? VW has the new 50 State legal 2009 Jetta TDI's out now, 1 per dealership for demo rides...you could of borrowed one from a dealership in Northern California (they would of got some free publicity), and you would of been getting 55-60mpg...not 22. Biodiesel is made from from converting vegetable oil using a methanol/lye mixture as a catalyst. It's clean, domestic, and renewable. We have put 40,000 miles over the past two years on two different VW TDI's using B99 BioDiesel...never had a problem. We love it! On a side note – I would seriously unconsider the notion of using biodiesel in a vehicle that old. The fuel lines and 'plumbin' is fragile enough as it is, and one thing biodiesel is will known for is it's ability to disolve stuff in a fuel tank, and in your case, disolve old rubber fuel lines, fuel pump diaphrams, etc. If you are firm on your commitment to using biodiesel, I would highly suggest you go to a diesel mechanic and have the fuel system thououghly checked out and and thing even slightly questionable, replaced. I have a 2006 truck with a diesel engine, and even the newer only have a recommendation of 10% biodiesel max due to the characteristics of biodiesel. Best of luck in your travels. That's the kicker for most of these alternate fuel vehicles: finding a placing to fill your tank. If your vehicle is for commuting only then it's no problem. Cross country? Might not even work. I'm driving from Albuquerque to Tulsa in a few weeks. Just for grins I did a little thought experiment: what it I took the trip with an Ethanol based vehicle? I could gas up easily enough in ABQ but the closest place en route was OKC! 600 miles away! I would need a 25 to 30 gallon tank for the trip! However with more and more cities using alternate fuels for city vehicles (including buses), I think we'll be seeing a lot more alternate fueling stations. I just hope they will open them up for more than just government vehicles (there's an Ethanol station in Amarillo, for example, but it's for government vehicles only). 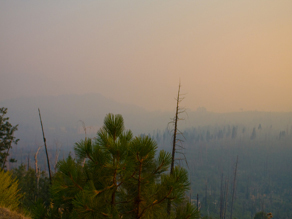 Air quality poor do to local fires in Yosimite..stay away if you have respitory problems! Could find a bio fuel station...idea....those that have stations could post on the blog where they are located to help Cody out. You did a good job reporting...fun watch. At the local grocery store, large jugs of canola oil. Olive oil, extra virgin, in an emergency ? Oil from pine nuts, maple syrum clog up a diesel ? Next trip, go real organic, campfire wood, steam boiler, eco-steamer ! Well, looks like you guys are stirring things up. Be safe and keep up the good reporting. That idea about getting the VW for free seemed like a good one. Not as much fun though, huh? Keep your wrenches shined up. You're in my neck of the woods! I run the Energy Resource Foundation, is based in Modesto. One of our projects is renewable bio-fuel (notice I didn't say biodiesel). Contact me on your way back so we can chat. Well your more than welcome to swing by Dallas and fill up here, Ive got plenty of B-100 to share! Agreeing with one of the above posts, please have the fuel lines checked... they can not be made of RUBBER!!! B-100 will eat right through em. Ive got 80K on B-100 on my 05 Jeep Liberty, been making it for 3 years now.